shopnewbalance.com: Running the Marathon: Do I Run to Compete or Run to Finish? 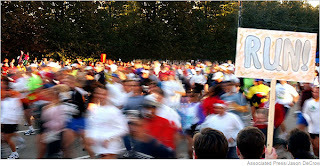 Running the Marathon: Do I Run to Compete or Run to Finish? I came across this article from the New York Times today about the Modern Day Marathoner. With convenient training programs, accessible information, and inspiration from celebrity marathoners, more runners than ever before are taking on the 26.2 mile journey. This article discusses the evolution of this idea and compares the current marathon training regime to how legendary runners trained in the past. So, what do you think of this recent craze of "normal" folks taking on the marathon? I personally get inspired by everyday people who want to take on the challenge. It shows me, if they can do it, then why can't I?